I am constantly seeing recipes all over the Internet for crock pot spaghetti. I've never made it in the crock pot before so I was excited to try it out. What makes my recipe so creamy is the cream cheese. 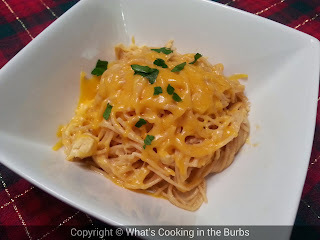 Combine that with sharp cheddar and chicken and this dish was a instant hit! I love that it's made without Velveeta and somewhat healthy! Thanks for sharing! Looks yummy! Going on next weeks menu! All this yummy cheese with the chicken this has to be awesome! Thanks so much for sharing with Full Plate Thursday and enjoy your weekend! Just found your blog through Freedom Fridays @ My Turn For Us. I like that you include WW points with your recipes. You have a great blog here!